16th century world without fantasy elements, and spelled her name "Sonya". 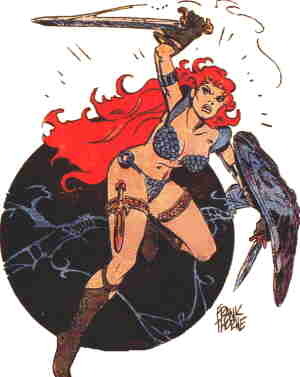 Actually, writer Roy Thomas (Arak, Son of Thunder; Ghost Rider) drew some inspiration for Sonja's basic character, tho none of the incidents of her life, from Sonya; but the Red Sonja who made her first appearance in Marvel Comics' Conan the Barbarian #23 (February, 1973) had never been seen before. The most obvious change in Red Sonja from the original Sonya was, of course, the setting. The "She-Devil with a Sword", as she was sub-titled, existed in a pre-tech never-land, full of monsters and wizards and whatnot. That and, of course, her chain mail bikini (speaking loosely — scale mail, or more properly, leaf mail, is often called chain mail). This outfit, which she almost always wore after her first couple of years, combined discomfort with impracticality, but made up for it by being extremely implausible. But probably the most salient difference between Sonja and Sonya was Sonja's oath to the supernatural entity who helped her recover from a teenage trauma (family all murdered, herself brutally raped and left for dead), the red goddess Scathach, never to "lie with a man" (as Code-approved comic books, where she mostly appeared, express it) until he's defeated her in battle. That was the price of the awesome combat skills Scathach granted her. Her introductory story, written by Thomas, which appeared in Conan #23, was drawn by the regular Conan artist, Barry Windsor-Smith (Machine Man, X-O Manowar). It was a rewrite, in the new setting and in comic book form, of the original short story by Howard. The origin story didn't appear until Kull & the Barbarians #3 (September, 1975), which, being a black and white, non-Code-approved magazine in the Mad/Vampirella format, was able to depict the full horror of the incident. Sonja continued as a frequently recurring character in Conan's series, and began to star in a few stories of her own by 1974. She first headed up a whole comic book of her own in Marvel Feature #1 (November, 1975), a revival of the try-out title where The Defenders had first appeared. It was in the second issue that she was first drawn by the artist who would become most closely associated with her, Frank Thorne (Mighty Samson, Moonshine McJuggs). Red Sonja #1 was dated January, 1977. It only lasted 15 issues, but she was back in her own title twice more during the 1980s. Between 1981 and '83, Sonja starred in a series of paperback novels published by Ace Books (which, by the way, had been the first publisher to put the original Buck Rogers novel in book form). Also, on July 3, 1985, Dino De Laurentiis Productions released a movie version with Brigitte Nielsen in the title role. Nielsen is scheduled to reprise the part in 2010. The Conan franchise, licensed from the heirs of Robert E. Howard, was a lucrative one for years, but eventually ran its course. Marvel allowed it to lapse during the early 1990s, and the rights to Red Sonja went with it. But a smaller company, Dynamite Entertainment (Project Superpower), picked her up in 2005. Dynamite, which also licenses Battlestar Galactica and The Lone Ranger, has had its greatest success to date with Sonja. She's even had a crossover with a very minor 1970s DC Comics character, Claw the Unconquered. With Dynamite's comic book going strong, and the second movie coming up, it looks like the Howard/Thomas/Windsor-Smith character, after years dormant, has a future. Text ©2006-09 Donald D. Markstein. Art © Red Sonja LLC.